How’s this for a baking focused cookbook subtitle: “From Plot to Plate“? Love it. if you are a natural gardener and baker, or even if that first skill eludes you, read on. I have to state right here and now that I have long considered myself to have a black thumb. I have killed two aloe plants in my life, which many said was impossible. Luckily my best friend Mary has a golden thumb – actually all 10 fingers are gold! She looks at something and it flourishes. And she lets me ask her to grow things for me to eat. And then we both cook delicious dishes and share them. Pretty good situation, eh? Just this week I was using purchased dried chipotle (jalapenos) to make homemade chipotle in adobe sauce. I asked Mary if we could dry her jalapenos this year to make the dish truly homemade and she of course said yes, so that’s the plan. Timing is everything; Grow Your Own Cake landed on my desk this week during my DIY frenzy and the entire book by Holly Farrell is all about baking and using the harvest from your very own garden. I absolutely love this idea and it is the first book that I have seen dedicated to the garden and the sweet kitchen. 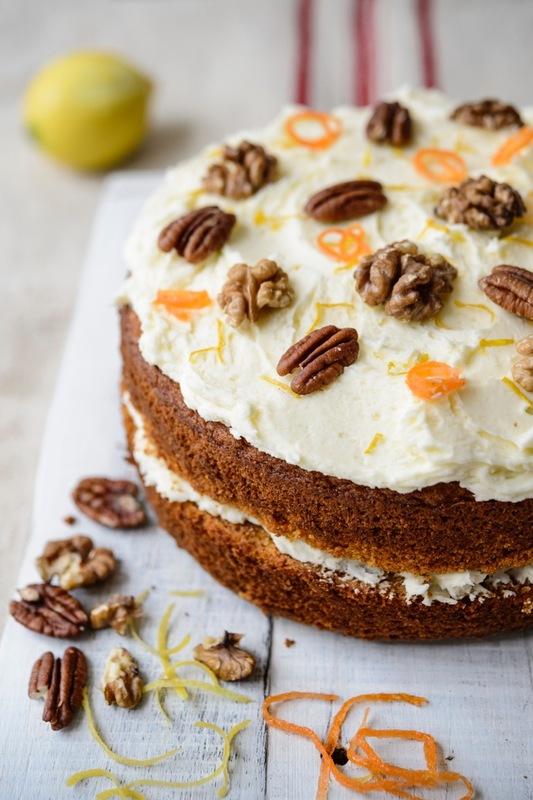 I am emboldened to try my hand at some carrots, so that I too can make a carrot cake from scratch such as the gorgeous one you see here. The book is laid out so that you can learn about planting, growing and harvesting a fruit or vegetable, such as rhubarb, berries, spinach, sweet potatoes, chiles and many more including herbs and flowers. Then there is an accompanying recipe. With gorgeous, inspiring and helpful images throughout, you will be getting your fingers in the dirt before you cover them with batter. Dig in (literally). Before you begin read up on various types of baking sugar and unusual sugars such as Muscovado. Excerpted with permission. Grow Your Own Cake by Holly Farrell. Published by Frances Lincoln, 2016. Photos by Jason Ingram. For recipes that call for blended or grated carrot, sweet, juicy, long, blunt-ended varieties are best, such as ‘Sugarsnax 54’, ‘St Valery’, any of the ‘Nantes’ type or the shorter ‘Amsterdam Forcing’ for growing in pots. When using whole carrots, as in Root veg tarte Tatin baby carrot varieties such as ‘Paris Market’ are a good choice, and also suitable for growing in pots. Sow carrots in a sunny spot in spring, and again at intervals until late summer. Scatter the seed thinly in a drill in well-prepared soil free from large stones. Small carrots can be grown in pots, and this is actually preferable to growing them in heavy clay soils. Carrot flies are attracted by the scent of the foliage so avoid brushing it while tending the plants. To protect the crop from such pests, cover with horticultural fleece or fine mesh. Clear plastic tunnels can also be used if aired daily. Check the edges and folds regularly for slugs and snails. Thin the seedlings once the roots have grown to a usable size, leaving one plant every 10cm/4cm or so. Satisfying as it is to just pull up carrots using the foliage, this should be avoided so the root does not break; instead use a fork to lever them out of the ground. Carrot thinnings provide the first harvest, while the main crop will be ready around four months after sowing. 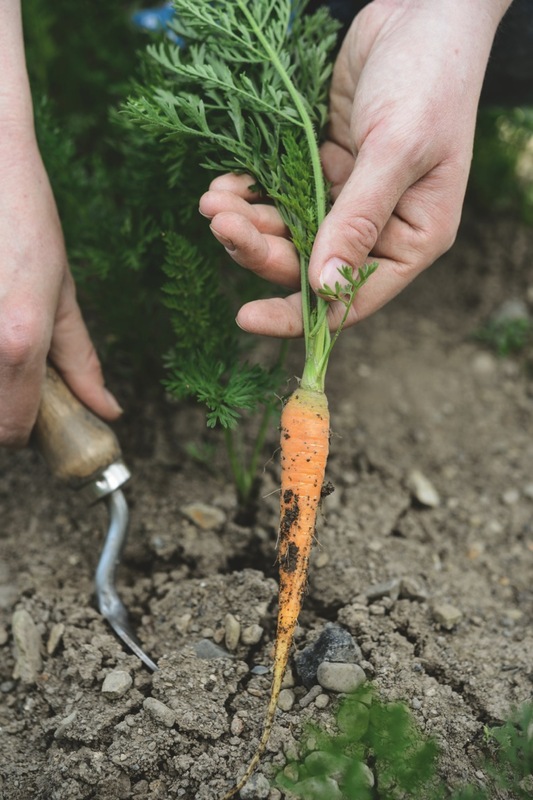 ABOVE Use a hand fork to harvest carrots, to avoid breaking the roots. 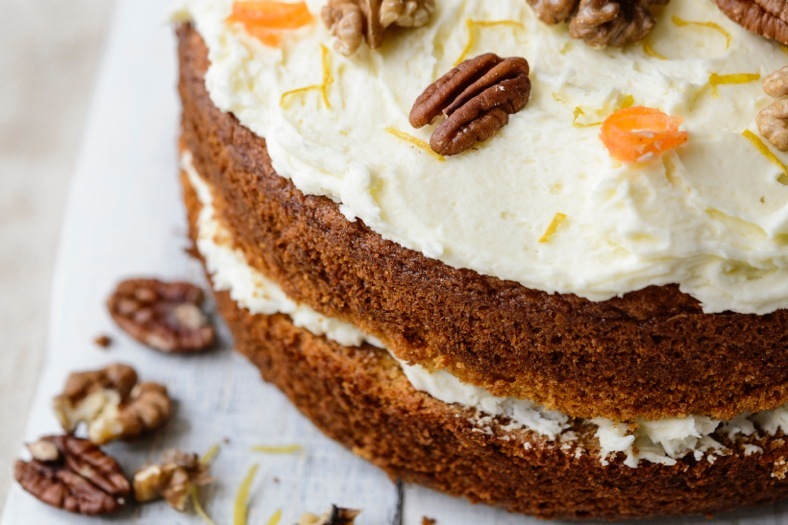 Perhaps the most well-known of all the vegetable cakes, and with good reason, carrot cake comes in many guises. This sponge version is lightly spiced, moist and includes a zesty buttercream. It is light enough for baking with fresh, sweet carrots in summer. For the cake, preheat the oven to 170°C/325°F/gas mark 3. Grate the carrots, then blitz in a food processor or blender with the yogurt and orange juice to form a rough purée. Set aside. Sift the flour, sugar, spices and baking powder into a large bowl, then beat in the butter until it has coated the dry ingredients and the mix looks like breadcrumbs. Beat in the eggs until just incorporated, and then the carrot purée for 2–3 minutes. Divide between the two tins. Bake for 30 minutes, or until a skewer comes out clean. Then remove from the oven and turn out the cakes to cool on a wire rack. For the candied carrot, using a zester or small knife, pare long, thin strips of carrot into a small saucepan. Then add the sugar and water. Bring to a simmer over a medium heat and cook for about 5 minutes, until a thin syrup has formed. Hook out the carrot strips and leave to cool on a wire rack. For the buttercream, sift the icing sugar and beat with the butter to combine, then add lemon juice to taste. Beat for 5–10 minutes until light and fluffy. To Assemble: Use half the buttercream to sandwich the two layers of cake together, and the other half to cover the top. Grate over the lemon zest and finish by sprinkling over the toasted nuts and candied carrot.